In this edition of homify 360, we visit a home with fantastic modern yet minimalist design, sensational panoramic views as well as a garden of great possibilities. It may be a home that is small in stature, but the charming design and sustainable technology utilised to create this nature loving house makes it one worth remembering. The home has been built mostly from wood, which is a material well-known for being a great choice due to its thermal and insulation effects. The contemporary elements of the house has incorporated glass into the design, which enhances the natural light and warmth of the home throughout the day. 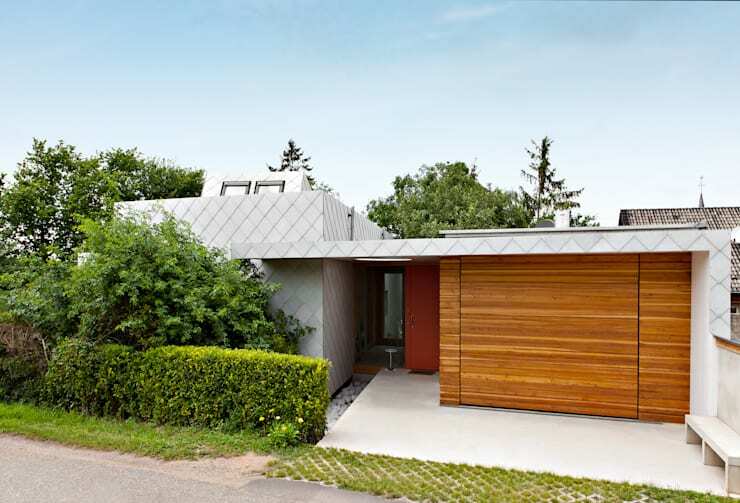 The first image we see of this fantastic and sophisticated modern home is the main façade. 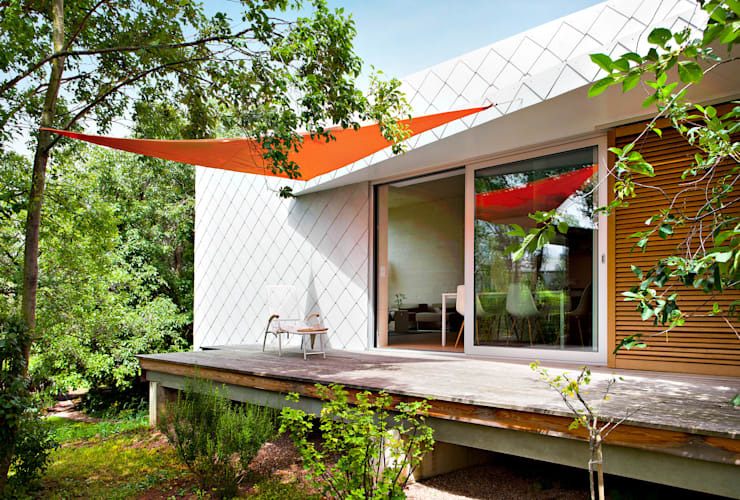 Cement fibres have been included in the design, serving an aesthetic purpose, while also protecting the home from the harsh rain and wind. Included in the design is a large red wooden garage door that adds a welcoming presence to the exterior, while perfectly contrasting with the grey walls. The gorgeous greenery at the front entrance of the home is just a simple attraction to this luxurious and stylish house in the suburbs. This magnificent home has large strategically placed windows that add picturesque sights to the fascinating style and attractive design of the house. While this cube is raised at a perfect height too, allowing for an aesthetically appealing view of the scenery. The wooden deck of the balcony allows for perfect integration between the indoor living space of this sensational contemporary home and the exterior, the architects created a comfortable extension of the living room that allows the inhabitants to enjoy the fresh air and sunshine, as and when they please. The vast greenery almost transports you to another space… perhaps a botanical garden or nature reserve? This living room design is perfect for this sleek and modern home. 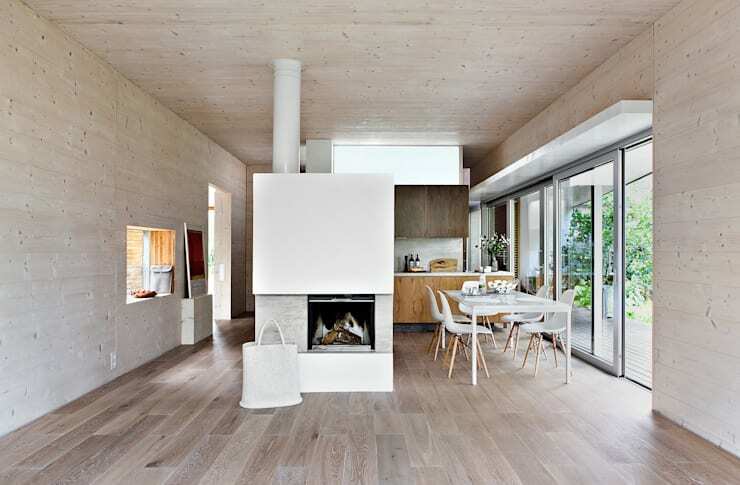 The light wooden ceiling, walls and floor is simple and minimalist, while this room is undeniably comfortable with its natural surroundings. From the greenery that peeks through the windows, to the glorious amount of natural sunlight that adds warmth and a friendly atmosphere to the interior. The fireplace is another great design choice that is functional and practical, especially during the cold winter months. This modern open plan living space works well in terms of design, with the neutral colours of the dining room and kitchen adding chic style to the home. 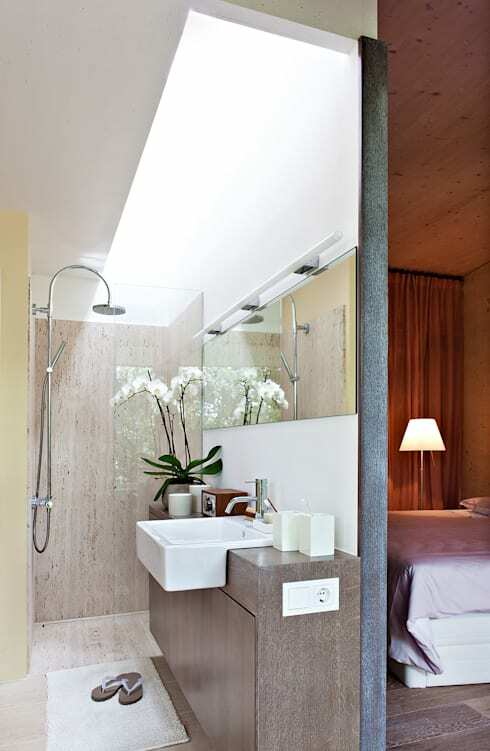 This image gives us a glimpse into the style and decor of the brilliant bathroom and bedroom. It's comfortable and relaxing, with neutral colours accentuating the simple style and design of the indoors. Another great feature of this en-suite bathroom is its perfect use of limited space, it still looks attractive and filled with light, even though the bathroom is quite small. By incorporating the white fresh flower, there is a natural and calming effect in the bathroom. 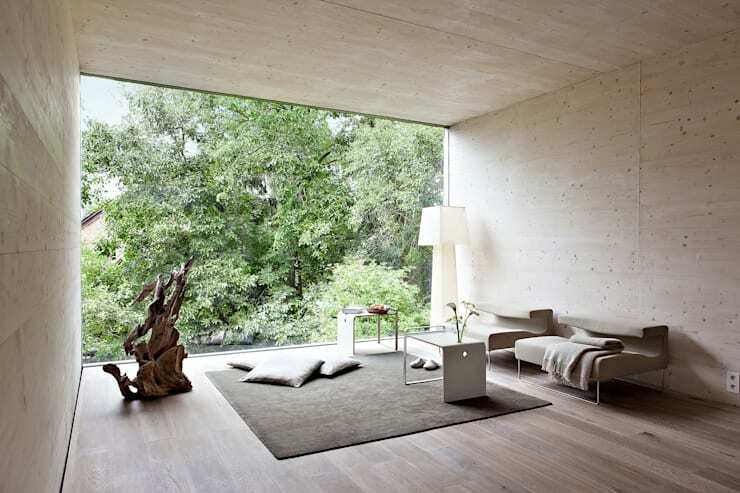 The less is more furnishings of this room, is the perfect match for this magnificent view of the gorgeous outdoors. You will get lost in your thoughts with this home design that allows for a dreamy resting place in the comfort of your own home. From the facade, would you have imagined this gorgeous nature loving sight? Just sit back and admire the simple environment and sensational views. 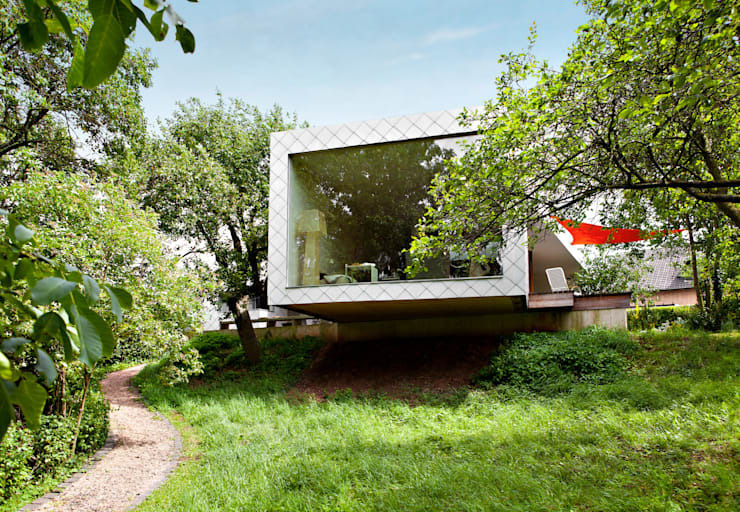 A gorgeous house with a surprise in the backyard is a great read too! Don't you just adore the nature views and scenery of this home?